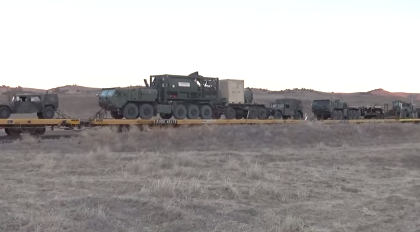 Even though Jade Helm 15 has 'officially' come to an end, the massive military convoys and preparation for something huge across America appear to be kicking into an entirely new gear as seen in the 7 newly released videos below. In the 8th video, Infowars takes a look at the '1st great war' of the 21st century. As has been stated several times before on ANP, to put an exact date on the global economic collapse or the official beginning of World War 3 would be foolish for anyone to do except for those truly on 'the inside' and while plenty of trolls and ignorant claim "see, nothing happened" after Jade Helm 15 'officially' ended, they couldn't be more wrong. During the past 18+ months, the buildup has continued all across the country and each and every day we see more signs that this buildup continues in earnest. While we are still unable to give an exact date, only a fool would think that we've now passed the point of danger... in fact, we are likely just arriving at that time. 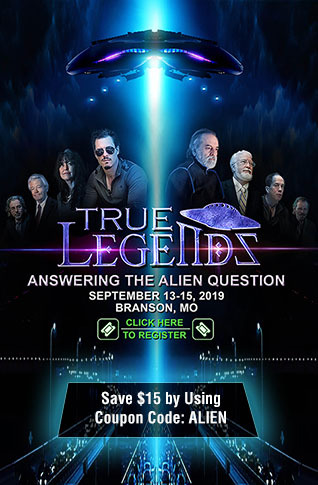 Anybody who has been truly paying attention to what has been happening across America feels the same way that we do, we have been witnessing the prepositioning of assets and manpower across America in preparation for something huge. With John Kerry recently warning Americans that the US will be accepting many more refugees into the country than had been planned for 2016 and 2017 as shared in this story from the Associated Press and continued warning that ISIS terrorists WILL BE in that group as the FBI tells us that they will be unable to vet all refugees, we feel like we're watching the clock tick down with not much time remaining until 'the big event'. 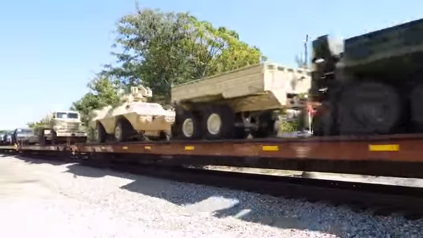 The videos below include the 1st one from Matt Botzilla in Shreveport, Louisiana as a train loaded full of patrol vehicles passes by with an armed law enforcement officer standing right next to the tracks. Certainly, he's more than allowed to be there but the question remains, WHY is he there? 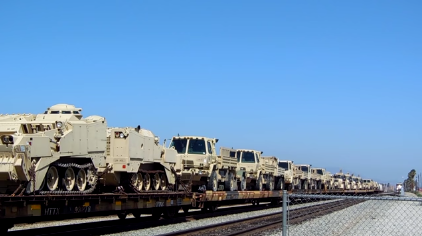 We also see videos from Professor Doom1 showing us a massive military transport train with Howitzers going through Gulfport, Mississippi heading west towards Louisiana and Texas in the 2nd video, a huge military train with massive amounts of equipment seen in Mobile, Alabama in the 3rd video on September 19th, a huge military train carrying all kinds of machines of war in Van Nuys, California in the 4th video, another massive train with medical 'red cross' vehicles seen in New Orleans, Louisiana in the 5th video and another massive military train seen in California in the 6th video. In the 7th video we see a mysterious 'Red Crescent' vehicle seen in Dunn, North Carolina with strange markings on it while in the 8th and final video, Infowars tells us why we're now on the verge of the 1st great war of the 21st century. We have to ask, with an American expert on Russia recently telling us that Russia promises to bring war to US soil if the US starts war with Russia (think Syria), is that what all this preparation is for, World War 3 in America? 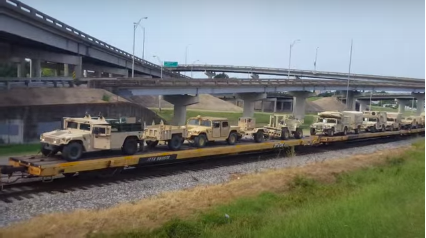 Please keep in mind that all of these train convoys carrying military vehicles across America were seen and videotaped across America in the last week alone. 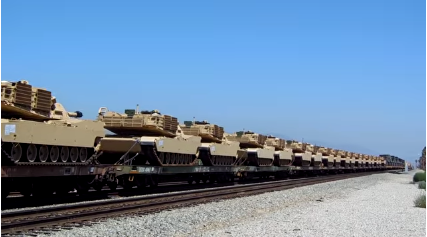 Since all of these videos show a HUGE amount of military movement across America, how many MORE trains do you think that there were moving equipment across America that were never caught on video?